It’s Super Bowl week, and time to indulge in guilty junk-food pleasures. In honor of this American tradition, I’m dedicating my post this week to Flamin’ Hot Cheetos, America’s worst junk food for kids. In the pediatric ER we talk about the “Flamin’ Hot Cheetos Sign” – when a child comes in with abdominal pain and has bright red dust on their fingers, it’s probably the Flamin’ Hot Cheetos. For several years I have seen occasional kids in the ER with concern for “blood in their poop,” only to find out that the red discoloration of their stool is due to eating entire bags of Flamin’ Hot Cheetos. The hot pepper spice in this product can also cause abdominal pain and burning. Kids eat lots of other junk foods, but Flamin’ Hot Cheetos is the only product I have seen bring kids to the ER. Why? Because kids eat the entire bag, not just a little snack bag, but the whole big bag. And then they still want more. With 39 grams of fat per serving, plus loads of artificial color and burning spices, it’s no surprise they cause gastrointestinal upset and slimy red poop. Yet the kids keep eating them, and just can’t stop. What makes Flamin’ Hot Cheetos so addictive? Why are they different from other junk foods? No one knows for sure, but our best medical hypothesis is that Flamin’ Hot Cheetos addiction is actually a kind of mild opiate addiction. Really, opiates. Here’s how: the red pepper kind of spice in Flamin’ Hot Cheetos causes a burning sensation in the gastrointestinal track. Capsaicin is the natural chemical in hot peppers that makes them hot. Our body has capsaicin receptors that respond to pepper spice as well as heat. In other words, our bodies interpret hot pepper spice irritation as a kind of burn. In response to this burn, our bodies release natural opioids that are normal neurotransmitters called “endogenous opioids,” or “endorphins.” And opiates make us feel good. Mix in just the right combination of salt, sugar, and fat, and you have a snack engineered to taste good and then keep you feeling good. Until the opiates are gone. Then you need to eat more. This habit-forming type of food is what David Kessler, MD, former FDA commissioner has termed, “hyperpalatable.” These are foods that provide such a rewarding experience that we keep coming back for more. Sugar, salt, and fat ingestion can also cause release of natural opiates, which is why so many people binge on ice cream, potato chips and other traditional junk foods. But Flamin’ Hot Cheetos adds the burning sensation, which may maximize the opiate release. The red dust that covers Flamin’ Hot Cheetos causes red staining on fingers, clothes, walls, and just about everything else. “Hands red like Elmo,” they say in the YouTube video. This janitorial nuisance has caused many schools to ban Flamn’ Hot Cheetos. Other schools are asking kids to take, “Flamin’ Hot Cheetos Pledges,” in which they vow not to eat them for one week, or even one day. One school reported kids turning in pledge cards with red finger prints on them. In 2010 I wrote my first post about Flamin’ Hot Cheetos . For about two years one of the major Google search stings that landed people on the blog was “Flamin’ Hot Cheetos get red stain out.” (For the record, I don’t know how to clean red stains from Flamin’ Hot Cheetos.) Then Monica Eng of the Chicago tribune broke the Flamin’ Hot Cheetos story in October 2012 to the traditional press I am honored she chose to close her article with a quote from me. As I told Ms. Eng, Flamin’ Hot Cheetos represents a chance for us, as parents, to teach the meaning of gluttony and self-control. And a lesson in self-control can last a lifetime. Talk to your school, ask for Flamin’ Hot Cheetos and similar hyperpalatable foods be removed from the a la carte line and/or vending machines. Better yet, ask them to remove the vending machines all-together. If your school expects parents to provide classroom snacks, work with the school nurse to develop a list of healthy school snacks, or see my post on healthy eating at school. 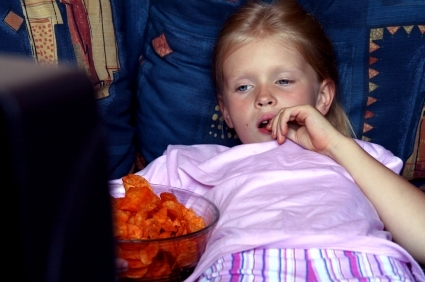 Limit screen time—you will automatically reduce your kids’ exposure to junk food marketing. Advocate for limited marking of junk food towards kids. The Disney channel recently stopped airing junk food ads. Write a letter to Nickeloden, Cartoon Network, or your child’s favorite channel and ask them to stop marketing junk food. Stop buying it. Make your house junk food-free. You might even need a family pledge. What have you done to reduce kids’ junk food exposure? What’s your Flamin’ Hot Cheetos story? 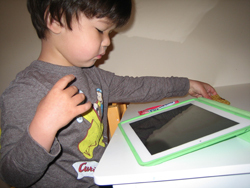 Is online privacy for kids a lost cause?